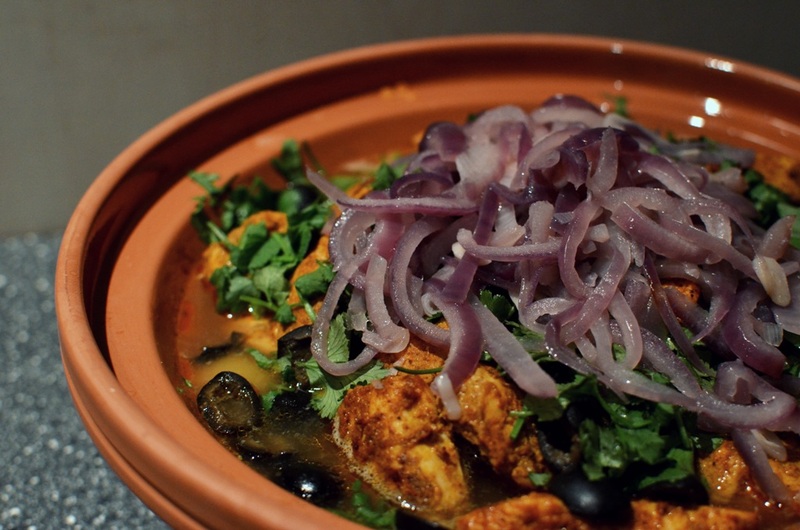 Chicken Tagine with Spinach, Olives & Preserved Lemons | An adventure with food. Whale received multiple Moroccan themed ingredients and a tagine for her birthday so naturally this is the result. On a side note we’re also going to Marrakech in the summer. I’m sure you could do this without using a tagine – a large casserole dish would probably suffice. Recipe modified from a gorgeous book – The Food of Morocco. Make up marinade in a large sandwich bag (or a plastic bowl). Add the chicken, give a good squidge around and stick in the fridge for a few hours. When ready to cook, put the saffron in 2 tbsp warm water. In a large frying pan sweat the onions over a medium heat for 5 minutes, then add the garlic for and sweat for a further 2-3 minutes. Tip half the onions into the tagine (put the other half to one side) add the chicken stock and saffron water, then layer over with lentils and spinach. In the frying pan fry the chicken with the cinnamon and turmeric then once sealed add on top of the spinach, with the preserved lemon quarters. Stick the tagine in a cold oven and put on 160oC/320oC/gas mark 3 for 45-60 minutes. 5 minutes before serving take the tagine out, top with the remaining onions, olives and chopped coriander and stick back in the oven. Serve with a side order of tagine bread (recipe to come).